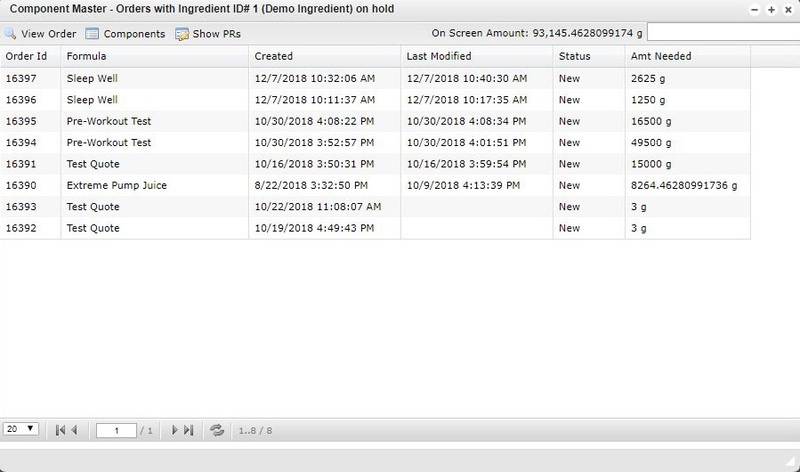 The Holds On… window shows all orders that have the component selected from the Component Master page as well as any holds in the system that are active for the chosen ingredient. This window provides valuable information like the Order ID, Formula Name, Creation Date, Modified Dated, Current Status and the Amount Needed to complete the order. View Order – The View Order window provides valuable information about your selected order number including the number of containers, current status, lot/batch numbers and much more. From this window, you also have the ability to review the order summary, apply testing charges or lock the order. Components – The Components window shows all components required to complete the order as well as the current inventory amounts and the hold amount required for the chosen order. This ensures you have the inventory needed for the completion of the order. Show PRs – The Show PRs… window shows all generated Production Records that include the selected Ingredient ID. From this window, you have the ability to view the selected Production Record and show any holds associated with your chosen formula.